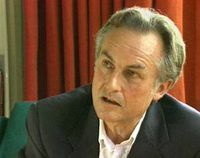 Criticize his book "The God Delusion" Make sure that you point out logical fallacies in it, and cite that since he does not have a degree in theology he is not qualified to write about God and thus doesn't know what he is writing about. If he has a restraining order against you, publish your book review on a fundamentalist christian web site like Fox News, or Glenn Beck's The Blaze TV so that they can use it in their propaganda attacks against him. Make sure to mention how his father is really Satan, and that even if he did marry Lalla Ward, he is the arch-enemy of The Doctor known as The Master. 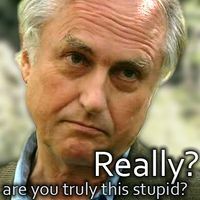 Not only that call evolution a hypothesis instead of a theory, in fact call it an "unproven hypothesis" because "it is not based on math" like other hypothesis and theories are. That really gets him annoyed. 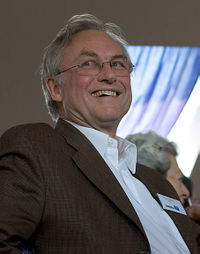 Dawkins has often said that he likes the saying that we should all be open-minded, but not so open-minded that our brains start falling out. Therefore tell him that philosophers have long discussed the Mind-Brain Identity Theory, but that he is to be congratulated on inventing the Mind-Skull Identity Theory. Tell him that, as a reasonable person, you don't mind him violating the The First Commandment of the Bible, but that you obviously have to strongly object to him being in permanent violation of The First Commandment of Uncyclopedia, namely "Don't be a Richard". ↑ Does biology require a lot of math? 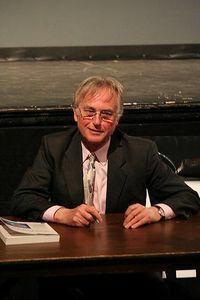 ↑ Is Richard Dawkins really stumped? This page was last edited on 28 November 2018, at 10:35.